More information: SH ultrasound - why, what, hardware, results. Horizontally polarised shear ultrasound waves (SH waves) have been used to perform a range of non-destructive testing (NDT) tasks, from thickness measurement of flat plates without calibration, to defect detection in simple and complicated structures, as well as welds. The polarisation of these waves is perpendicular to the oscillation direction, and in the same plane as the generation surface. Depending on the sample thickness, the range over which the inspection is taking place, and the wave mode generated, the SH wave can either behave as a guided wave or as a bulk wave. By changing the range of inspection and the wave mode, which form the wave takes can be used to optimise a given technique to find defects in a specific area, or to be able to detect a slight change in wall thickness. This flexibility has led to SH waves being able to detect a greater range of defects than some other wave types, such as compression, shear vertical (SV) waves, or Rayleigh-Lamb waves. SH waves have a dispersion equation that has a simple analytical solution, unlike, for example, Rayleigh-Lamb waves, for which the dispersion equation must be solved partly numerically. This makes it very easy to find the appropriate frequency to generate a wave mode, based on knowledge of the sample wave speeds and thickness. The inverse is also true; based on knowledge of the wave speeds for at least two SH modes, the sample thickness can be deduced. As single frequency waves can be generated, measuring a phase speed is relatively simple, making the whole process feasible. Consequently, a thickness measurement can be performed without prior knowledge of the sample wave speeds, which may change due to texture, temperature, or stress. Different wave modes have different frequency-thickness cut-offs, and different phase behaviour when interacting with defects. Therefore, the dispersion of the different modes can again be used when searching for and quantifying defects in thin samples, including wall thinning. SH waves do not mode-convert when interacting with an interface that is normal to the propagation direction, and this allows them to reflect from boundaries without mode-conversion, or travel round complicated structures without mode-conversion or much loss of wave energy. Consequently, they can be used to inspect complicated structures without the waves suffering significant attenuation. SH waves are also effective at finding defects in welds. Periodic-permanent-magnet (PPM) electromagnetic acoustic transducers (EMATs) use an array of magnets with a polarisation that switches from up to down periodically. The periodic structure means that a specific wavelength is preferentially generated and received. Different wave modes within the SH dispersion curve can be generated, as they have different phase speeds, leading to different frequencies for a given wavelength. What this provides is mode selectivity, and it also means that the amplitude of the SH waves generated is far larger than the amplitude of other wave types (such as Rayleigh waves) generated simultaneously by the transducer. It is relatively easy to measure the phase speed of single frequency waves. 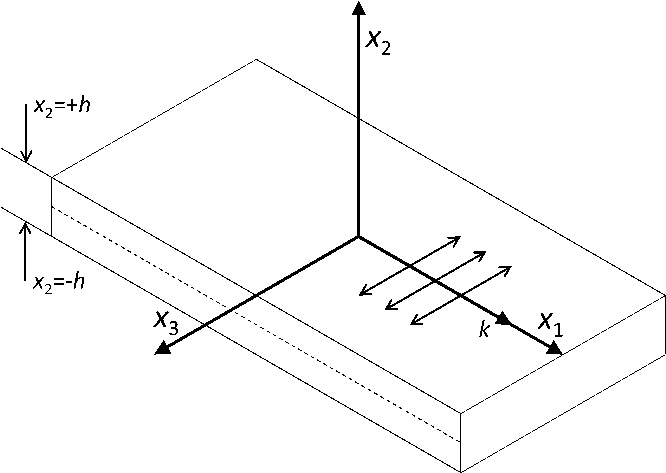 An EMAT with a different pitch can be used if a different wavelength is more suitable for a given application. The structure of the EMAT also means that the dominant angle (in the direction perpendicular to the surface plane) the wave is emitted at can be changed by modifying the pulse frequency. Other advantages of EMATs are that they do not require any couplant with the sample, and allow operation on curved surfaces without profile matching. However, due to the periodic structure, they cannot work with more than approximately 1mm of lift-off from the sample. This picture depicts the oscillation direction (x3) of an SH wave relative to the propagation direction (x2). The displacement through the thickness of the sample will vary depending on the SH wave mode.